Blurb- It only takes one drink from the Water of Immortality to kill Evie Woods—halfway. Trapped in undead flesh, the world’s last skin-slider wakens on an island purgatory where a cursed spring bubbles with immortality, and zombie cannibals crave living flesh. Her only hope of escape rests in the hands of the one man who would see her fail. Bound to her by cords stronger than death, Lord Victor Lowell is both the man of her dreams, and her darkest nightmares. Contrary and intractable, Victor preys on others to maintain his angelic charisma and preternatural prowess. Drawn to the compellingly gallant and vulnerable soul behind his mercurial humors, Evie can only watch as protecting her forces Victor to sacrifice yet more of himself to the ancient evil long tethered to his soul. Trapped in an ever escalating war they can’t stop, Victor and Evie fight time for a cure, but as the long days pass blackness tears at Evie, ripping her thoughts from her one memory at a time. Victor will to do whatever it takes to prevent her from deteriorating into a rotting husk, even if it means dooming himself, but Evie won’t surrender his soul without a fight. Battle lines drawn, the soul mates resolve to find redemption or die trying. 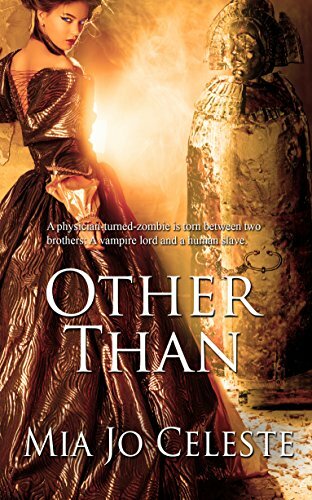 Abducted to an 18th century island purgatory, a physician-turned-zombie’s destiny is torn between two brothers: a vampire lord who promises a glamorous, immortal passion, or a human slave who offers an experimental cure and his heart. What judges are saying about Other Than. Your way with words instantly pulled me in. The writing is quite vivid and brings the story to life. Beginning with the protagonist’s death is a sure fire way to catch interest. As far as zombies it’s pretty believable. Evie looks as if she’ll be a great protagonist. Engaging writing voice. It pulled me right in. It’s obvious this character’s immediate future will be filled with both internal and external conflict. Your premise is wonderfully fresh – I’ve never read anything like it before! You’ve skillfully combined paranormal and historical elements – not always easily done – but you’ve made it believable. Well done. I loved this entry. I really did! Very fresh and intriguing – I want to read more to find out who this mysterious lord is who’s taking the newly dead. Is he the hero or the villain? You’ve made me want more, which is fabulous. Great job with this story! You had me from start to finish. The whole entry had me hooked. I love how you’ve painted this character, this story, the setting, everything. Your use of language is enviable. It’s all done well – I can’t even go back and pick out certain passages to highlight and praise because the whole thing would be highlighted. This is a great story. It was different, interesting and emotional. I really think you did several things well. First, your style is excellent, the characters believable and interesting. I loved the world you created, it is different and I really wanted to learn more about them. The synopsis indicates that your story continues along the vein of being interesting and intriguing. GREAT BEGINNING IN BUILDING THIS PARANORMAL WORLD. IMAGES CAME ALIVE IN MY MIND. A FRESH TAKE ON A PARANORMAL THAT HAS THE READER IN ME INTERESTED. NEW TWIST ON ZOMBIE AND VAMPIRE. IT’S GREAT.